Try one of these fast and simple soup recipes for a healthy and warming winter lunch or supper. When it’s cold, wet and icy outside there’s nothing like a warming bowl of nourishing soup. Soup is healthy, satisfying, extremely versatile and ideal for cooking in bulk to keep you going for a few days or store in the freezer for when you need it. It's also perfect for using up leftover meat and vegetables. 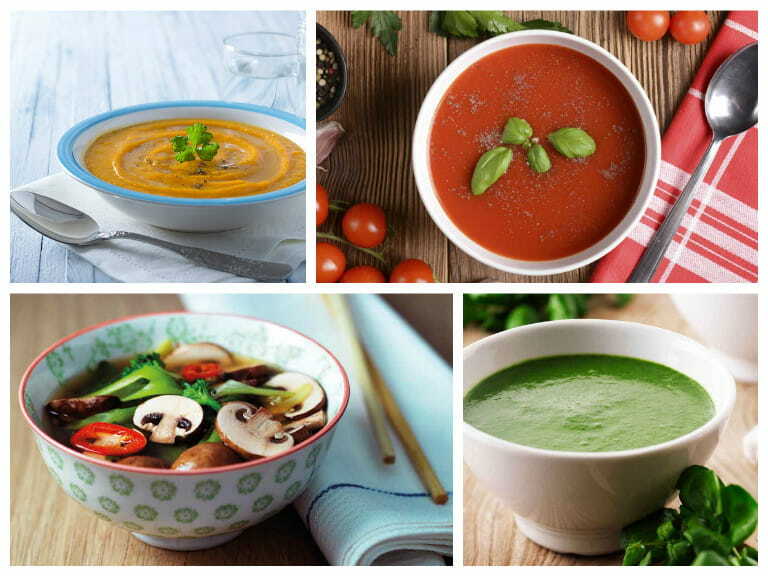 All these soups can be made with minimal fuss – simple ingredients cooked gently for under an hour. This simple chicken soup is an ideal way to use up leftovers from the Sunday roast. A simple and healthy green soup finished off with an optional swirl of beetroot. This simple combination of tinned chopped tomatoes, pasta and chopped fresh vegetables makes a deliciously easy and healthy soup. Try Mary Berry’s recipe for a classic silky smooth leek and potato soup. A quick and easy Japanese-style soup made with miso stock. Try this extremely easy tomato soup recipe for a vitamin C boost this winter. This deliciously spicy carrot soup flavoured with chilli and ginger makes a wonderful change from the more common carrot and coriander. Watercress soup is an easy way to get the health benefits of these nutritious greens that are packed with antioxidants.